Some places appeal so much to your heart that you get an intense desire to visit them, Khidrapur is one of such places. I came to know about this place some half an year ago and was keen to visit. Each hectic visit to Kolhapur somehow didn’t allow me to do so and this fact made the desire stronger and deep. Finally my latest trip to Kolhapur was fruitful. My sis took out time from her busy schedule and made it so. We headed for Khidrapur in the morning. We took up road to ‘Narsobachi wadi’. It was pleasant drive through lush green fields of sugar-cane. It rained very heavily which added to the atmosphere. I found some birds like Shrikes, Brahminy Kites and Black-shouldered Kite on the way. Cross small villages like Dharma-nagar, Chipri, Shahu Nagar, and Shirol to reach Narsobachi wadi. From Narsobachi wadi, take road of Kurundwad and then via Sainik Takli reach Khidrapur village. Approx distance is 60-65 Kms. We reached Khidrapur. It is very small village with farming as primary occupation. As I parked my car, I got few early glimpses from road. This magnificent temple belongs to Lord Shiva, and named as ‘Kopeshwar’. I crossed the old stone entrance which brought us to temple vicinity. Kopeshwar reminded me of wonderful architectural carvings temples of Halebidu and Bellur. It is believed that Kopeshwar temple was built by three generations of kings, the Shilahar kings Gandaraditya, Vijayaditya and Bhoj-2 between 1109 and 1178 AD. There are Devanagri writings in the temple to support this. It’s also one of the few temples where both the Shaivas and Vaishnavas, who are arch rivals, come together in worship. The mythological story behind the name ‘Kopeshwar’ is – Devi Sati (daughter of King Daksha) was married to lord Shiva. Daksha didn’t like in son-in-law at all. He was about to perform some yagna (hindu ritual performed along with holy fire) and he didn’t invite Sati & Shiva. Devi Sati felt sad and went to meet her father asking the reason behind not inviting her husband. In turn, King Daksha insulted Shiva and it was unbearable for Sati to tolerate her husband’s insult. She jumped in the yajna. 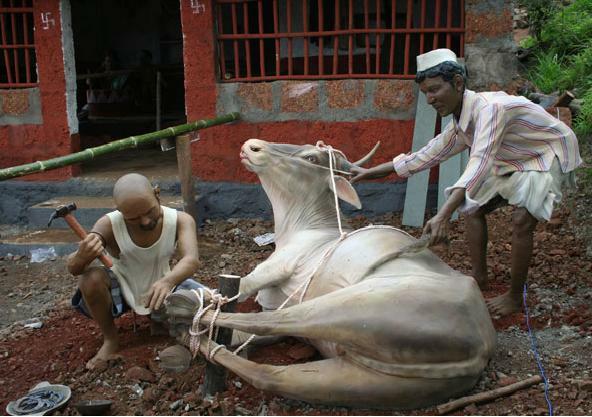 Hearing this news, Shiva was furious and he punished Daksha by cutting his head. Later on, due to request of other deities, Shiva took back the curse and granted him life with goat’s head. It is believed that angry Shiva was brought to this place (temple) to cool his anger. Hence the temple got its name i.e. ‘Kop’ means anger and ‘Eshwar’ means lord Shiva. Temple stand firm with all its glory of stone carvings of 95 elephants and 108 pillars and hundreds of sculptures depicting scenes about from the Mahabharata, Ramayana, Shiva, the twelve astrological signs and flowers, trees, birds, human figures. As you step into the beautiful Swarga Mandap, you can actually feel the coolness. There are 12 superbly carved pillars which support the stone ceiling that is open to the skies. There is a beautiful round black stone slab at the centre which is called the ‘rangshila’. It is an amazing experience to sit on the centre of the stone round open ‘akaash gavaksh’ on the ceiling and look towards the dark inner sanctum of the grabha griha with its beautiful Shiva linga. It is said that all ‘adhyaaya‘ (parts) of ‘Shivlilamrut‘ are carved on the walls of the temple. Next comes Sabhamandap, Antaral-kaksha and Garbhagriha. The Garbhagriha is more cold and dark. The shiva linga, burning lamps make the atmosphere peaceful and divine. I was surprised to know that there was no nandi in the temple in spite of the fact that it is Shiva mandir. This is probably one of the unique things about this place. Another unsual thing here is sanctum has lord Vishnu first and then the Shiva linga to protect it. Each visitor first sees lord Vishnu and then Shiva. It is sad that most of the sculptures are badly damaged by Islamic invaders in the later centuries. There is a story that one of Aurangzeb’s descendants strayed when wandering around on her own and came across this temple. She loved the place so much that she refused to leave the temple complex and go with her attendants. The Mughal Emperor came personally to fetch her. She agreed to leave on the only condition that he will not harm the temple and damage its beauty and so the temple remained untouched from the otherwise merciless Aurangzeb. Khyder Khan, a later invader supposedly mutilated the carvings on the temple and cut almost all the elephants’ trunks. There are no exact historical evidences of ‘who destroyed what’ but it is very painful to see such beauty ruined. Unfortunately, the village of Wadi-Kopeshwar later came to be known as Khidrapur after this cruel invader. Kopeshwar temple gave me much more than I expected. It gave me peace, joy and an opportunity to appreciate my homeland. Once again I felt proud to be an Indian and lucky that I can see all this. I clicked some snaps. It is really sad that such wonders are still unknown to the tourists. Saddest part is there are no milestones or sign boards about Khidrapur. We had to wait and inquire at several places. Also there is no much information available on internet. This ancient architectural splendor should be made popular so that more and more people of similar interests can come and visit here. Such place needs to be maintained and conserved. I decided to take another way while returning just for sake of finding new route and took road to ‘Ichalkaranji’. A fox gave us generous visit on the way and disappeared in sugarcane fields. It rained very heavily and many huge trees were uprooted on the way. I took a bypass through small village. It was messed up too. I could see a huge line of cars in jam for about 2 Kms at least. Paul, our lab doesn’t like it, if the car stops and in few minutes his barking attracted all the kids of the village. Kids gathered around our car and tried to get his glimpses through sun control filmed windows. Whole situation seemed funny and equally irritating as Paul was getting impatient. Finally, when I was about to start my car, I opened the car windows and all kids were very happily to see our handsome black Labrador. After testing all my patience by worst traffic jam, lengthy waiting hours at railway crossing and narrow roads, I reached Kolhapur at 8:00pm. Kopeshwar, (yes I prefer to call it just ‘Kopeshwar’ instead of ‘Khidrapur – Kopeshwar’) is strictly no miss-miss place if you are planning a visit to Sangli, Miraj, Kolhapur and alike. I visited a very unique and interesting type of museum in my last visit to Kolhapur. I had no idea about it until my sis chalked a plan to take me there. 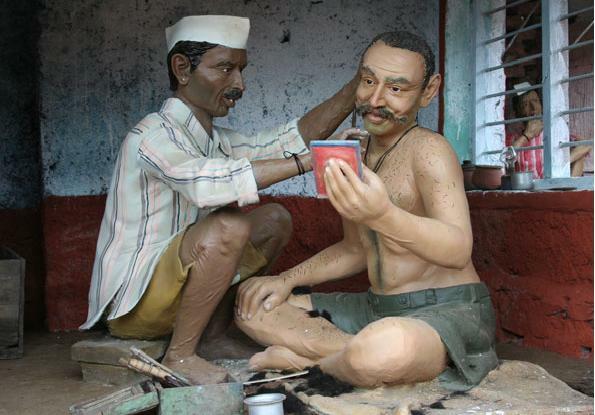 The museum is called ‘Siddhagiri Gramjivan (Village life) Museum’. This unique project is the only of its kind in India and situated at Shri Kshetra Siddhagiri Math, Kaneri near Kolhapur. 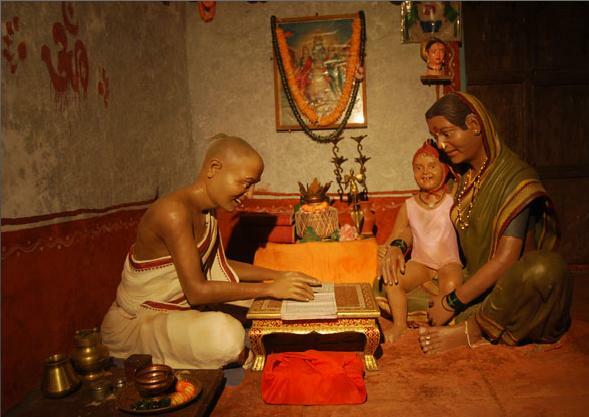 Many people know about Kaneri Math but very few know about this museum. For those who even don’t know about ‘Kaneri Math’; here is something – It is holy place with Shiva mandir. It is believed that Shiva linga was installed by a Lingayat Priest on a beautiful hill in the 14th century. The temple is beautiful and peaceful with huge Nandi. About 500 years ago, a Lingayat Priest Kadsiddheshwar Maharaj developed and renovated it and hence the place is now known by his name. A 125 feet deep well and 42 feet huge Shiva idol is another worth watching. OK. Our main destination is Siddhagiri Gramjivan museum so I am getting back to it. 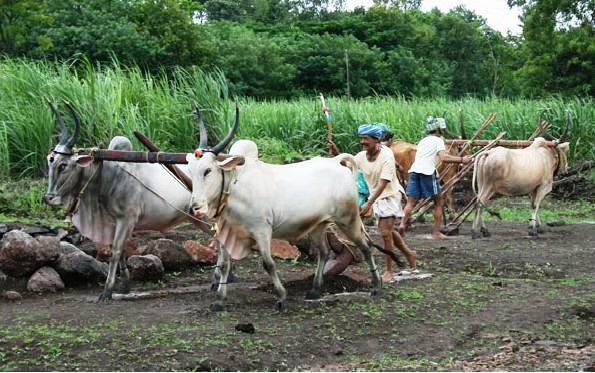 Take right from “Gokul Shirgaon Junction” to go to Kaneri village. Drive approx 4-5 Kms to reach Siddhagiri Museum. We started at 9:00 am and reached there in half-an-hour. The entrance of the museum itself was interesting. We bought tickets and entered inside. This project showcases different aspects of Gramjivan. ‘Gram’ means ‘village’ and ‘jivan’ means ‘life’ in Marathi language. This initiative was dream project of Mahatma Gandhi, visually and symbolically created through the vision and efforts of Siddhagiri Gurukul Foundation. 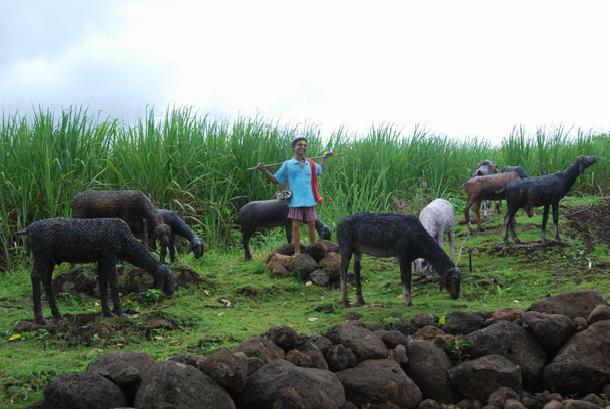 The history of self-sufficient village life before invasion of Mughals in Maharshtra is depicted here in the form of sculptures. Each sculpture seems to be very live and has a multi dimensional effect and lifestyle theme. There were 12 ALUTEDARS (12 main profession based castes i.e. Professions performed from generation to generations by families) and 18 BALUTEDARS, who provided equipments to all villagers to fulfill their day-to-day necessities (domestic as well as professional). Village priest’s abode: First scene is house of highly educated village priest. He performs duties, rites and rituals like weddings, thread ceremony, to find out auspicious day and moments for house building and house warming activities, digging of new wells, sowing seeds, punching of noses and ears etc. He earns his livelihood from ‘Dakshina’ he gets. He consults and then refers to the ‘Panchaang’ (almanac) for finding auspicious occasions. Nailing the bullock with iron shoe. 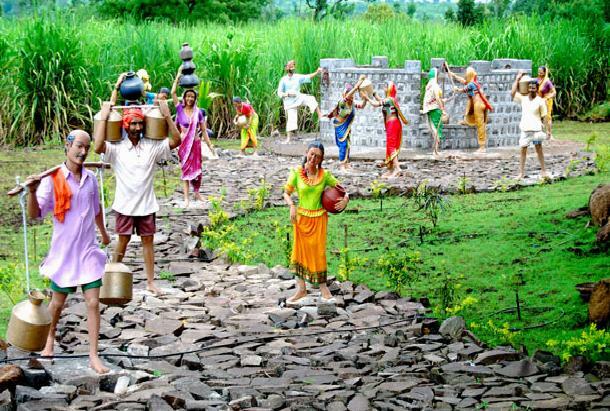 Village well – Villagers fetching water from public well. Nursing of elder family member. Grocer’s shop: Woman visiting grocery shop with her son. Shop-keeper is weighing items in old weighing machine. Items like jaggery, sugar, chillies, salt, wheat, rice are kept. Son is asking his mother to buy kites for him. Farmers ploughing in farm with bullocks. Shepherd boy with his herd of sheep. 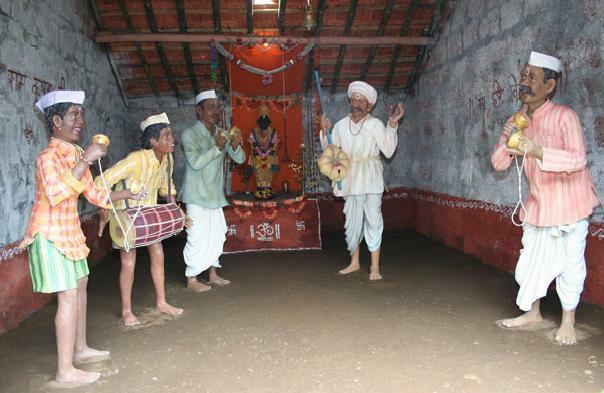 Villagers performing Bhajan and Kirtan (singing Hindu devotional songs). The museum is spread over 7 acres of area and has almost 80 scenes which showcases more than 300 statues. The surrounding is also very beautiful and there is greenery all over. Each and every small aspect of village life is taken into the consideration. It is perfect blend of wonderful facts, powerful imagination and loads of hard work in getting those expressions and liveliness in whole village. It is just beyond imagination and surprisingly amazing!!! Inside there is also good facility for refreshments. We enjoyed some snacks and ice-creams. We came out and again there was another good park opposite the museum waiting for us. The park is called ‘Raashi Park’. ‘Raashi’ means ‘Sun sign’ according to Marathi astrology. This beautiful park has beautiful floras along with sculptures of all the Sun signs and short description about each of them. At entrance of park, there is sculpture of bullock cart and a photographer clicking it. I clicked both of these replicas. The scenes listed above are just trailers. I couldn’t restrict myself from saying “Picture abhi baki hai…mere dost!” and you have to visit here and see it with your eyes to trust me. 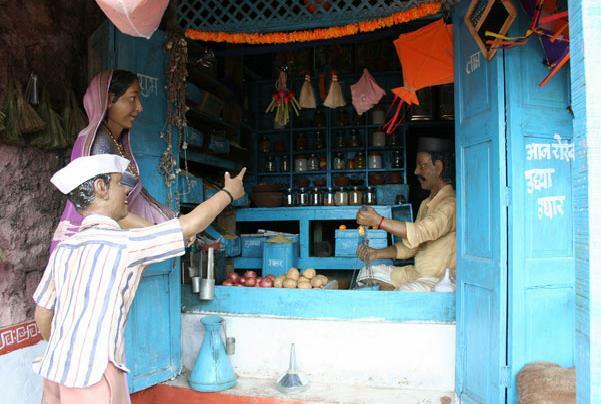 Next time you visit Kolhapur, make sure you don’t miss this wonderful place.